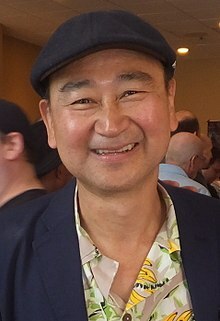 Gary "Gedde" Watanabe (born June 26, 1955) is a Japanese-American actor and comedian. He is perhaps best known for voicing the character of Ling in the 1998 successful animated film Mulan and its 2004 sequel, Mulan II as well as playing Long Duk Dong in the 1984 film Sixteen Candles. In 1976, Watanabe's first role was as a member of the original Broadway cast of Pacific Overtures, originating the roles of Priest, Girl, and The Boy. He has since appeared in a number of films and television series, the first of which was The Long Island Four in 1980. Many of his roles are caricatured East Asians with heavy accents, though he does not speak Japanese. Jason Buchanan wrote for Allmovie, "The character that Gedde Watanabe is most remembered for is Long Duk Dong, the clumsy foreign exchange student in [the 1984 film] Sixteen Candles," a role decried by some Asian-American groups as "stereotypical, racist and part of a long history of Hollywood's offensive depictions of Asian men." "I was making people laugh. I didn't realize how it was going to affect people," Watanabe said in 2008. "It took me a while to understand that. In fact, I was working at the Metropolitan Museum of Art, and I was accosted a couple of times by a couple of women who were just really irate and angry. They asked, 'How could you do a role like that?' But it's funny, too, because at the same time I laugh at the character. It's an odd animal." He had a starring role in both the film Gung Ho  and its television spinoff. In the 1989 movie UHF  starring "Weird Al" Yankovic, Watanabe co-starred as Kuni, a karate instructor and abusive host of a TV game show called Wheel of Fish. He later reprised this role on the Weird Al Show. Watanabe appeared on Sesame Street from 1988 to 1991 as Hiroshi and had a recurring role as gay nurse Yoshi Takata on the television drama ER  from 1998 to 2002. During the nineties, Watanabe studied acting at Theater Theater in Hollywood, California, with Chris Aable who introduced him to fellow actors Jon Cedar and Steve Burton. He voiced various Japanese characters on the animated television comedy The Simpsons. In 1998, he voiced Ling in the Disney animated film Mulan and reprised this role for the 2004 direct-to-video sequel, Mulan II and the 2005 video game Kingdom Hearts II. Watanabe grew up in Ogden, Utah in a Japanese American family. His mother, who had been previously interned during the World War II internment of Japanese Americans, worked as a seamstress at the Utah Tailoring Company. He was in several dramatic productions in high school, both acting and singing. After graduation, Watanabe left Ogden for San Francisco, where he hoped to make his living as a street musician while honing his acting skills. ^ a b c d e "Gedde Watanabe". The New York Times. ^ Ji, Hyun Lim (22–28 June 2001). "Backstage with Gedde Watanabe". Asian Week. Internet Archive. Archived from the original on 4 August 2001. Retrieved 10 February 2013. ^ Buchanan, Jason. "Gedde Watanabe Biography". Starpulse.com. Starpulse.com. Retrieved 10 February 2013. ^ a b c MacAdam, Alison (24 March 2008). "Long Duk Dong: Last of the Hollywood Stereotypes?". All Things Considered. NPR. Retrieved 31 December 2016. ^ Smokler, Kevin (20 May 2014). "Gedde Watanabe Discusses 30 Years of Sixteen Candles and Long Duk Dong". Vulture. Retrieved 31 December 2016. Wikimedia Commons has media related to Gedde Watanabe.